It wouldn’t be long before the plummeting winter temperatures froze the river over completely. Apparently it is then possible skate all the way to Stockholm, some 45 miles away. “Is the bus station the last stop?” I asked the driver, everyone else having departed en route from the airport. It was unlikely to be otherwise, of course, but at 11pm, after endless flight delays, my brain had become a little muddied. “Yes of course,” he replied, smiling indulgently. “Have a nice evening!” I stepped out onto the icy November pavement in the centre of Uppsala, Sweden. My sole aim for what remained of the evening was to stumble into the Hotel Svava and locate my bed. Startlingly blue sky awaited me the next morning as I pulled aside the curtains. A brittle sun illuminated the snowy roofs opposite. Uppsala was quiet this morning, with only a few locals going about their business – although a parade of schoolchildren marching and singing through the streets provided charming local colour. When I finally made it outside, I asked the assistant in a nearby photographic store what it was all about. “Oh, they are celebrating their culture,” he replied slightly enigmatically, “and being out of school, too.” That sounded more likely to me. The spire of the 13th century Domkyrka, or cathedral, dominated the compact city centre. Spearing 400 feet into the air, it provides an obvious focal point. Inside, numerous alcoves house the tombs of some of Sweden’s finest, including St. Erik, the country’s patron saint and King Gustav Vasa, who freed Sweden from the Danes and revitalized Sweden in the 16th century. Only on the way out did I notice the English language leaflet, but words weren’t necessary to appreciate fine vaulted columns, impressive stained glass and colourful frescos. 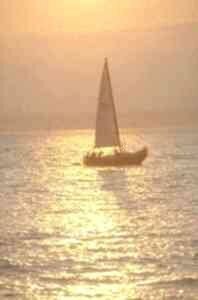 Outside, the river Fyrisän flowed unhindered through town, its shallow water passing under a number of bridges. It wouldn’t be long before the plummeting winter temperatures froze the river over completely. Apparently it is then possible skate all the way to Stockholm, some 45 miles away. Quite a challenge, though! 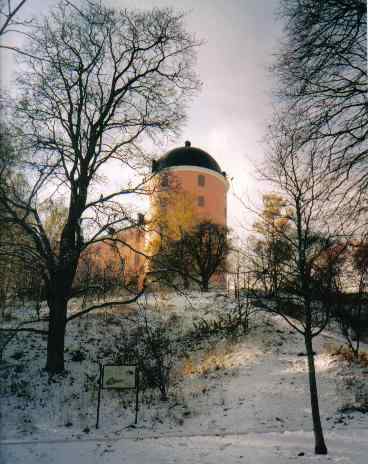 Gustav Vasa’s pastel-coloured Slott (or castle) occupies a hilltop location within the city centre. 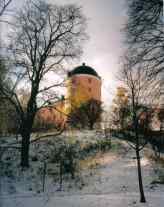 Since most castles are generally imposing, grey, impregnable fortresses, the Slott came as a pleasant surprise on the eye. A shade of pink was prominent; the walls did not rise to any great height and battlements were not apparent. It stood proud in the recent snow, tall against a steely grey sky. The structure contains the Hall of State and is today is used for various festivities. I crunched my way past the silent façade and down a snow-coated track to the base of the hillside. Across the main road from the castle were the botanic gardens where snow lay pristine on most of the tracks, creating a picture-book scene of a white lawn, frosted benches, and landscaped hedges topped with white, all leading up to a large orangery. Lurking among the tress was the surprising find of a snow-covered bear-topiary looking like a snow sculpture. 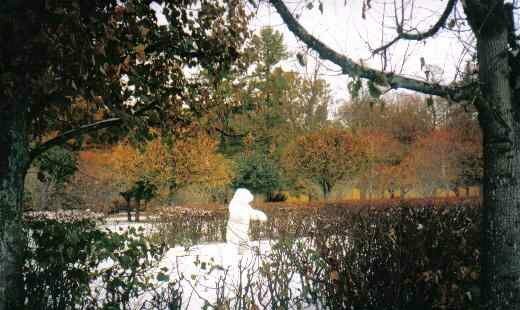 My stroll around the gardens was very relaxing, despite in the cold. The theme of plants and the naming of them is particularly important in Uppsala, since this was where the great taxonomist Carl Linneaus lived and worked. Known as the ‘Father of Modern Botany’, he described over 10,000 species of plant. Linneaus’ garden on Svartbäcassata resembles how it would have looked back in his day, 250 years ago. Unfortunately for me, I actually had to do some work whilst here, but dinner among colleagues that evening gave me a chance to sample some typically Swedish food at the Domtrappkällaren. The menu was fixed, and so it was easy to sit back and enjoy caviar followed by rare reindeer meat. This was all washed down with some local schnapps and red wine. It wasn’t a meal for those of a frugal nature. 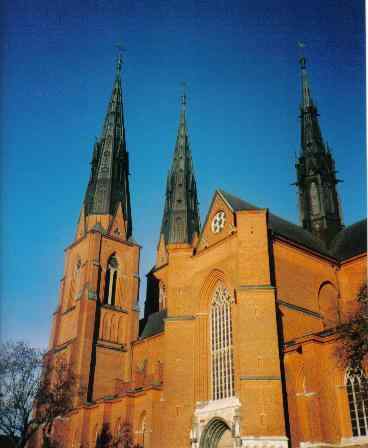 The jewel in Uppsala’s crown must be the Gustavianum. Built in the 1620s as the centre-piece of the University, it is now a museum and filled with many treasures. A guided tour was given by an extremely urbane and knowledgeable – if a little eccentric – guide. He gave us the facts. In clipped tones. Spoken very quickly. He was the Swedish Patrick Moore of the tour-guide world. Other extraordinary collections included the amazing Augsburg art cabinet, containing around 1,000 artifacts inside an ingenious doll’s-house like casing. Designed by Philipp Hainhofer in the 17th century, the contents are meant to represent a world in miniature. Being someone who would struggle to assemble a cardboard box, I had to admire the skill and confidence of those who had taken it apart to study. They seem keen on taking things apart here. The high point of the collection for me was the original thermometer of Anders Celsius, still accurately recording temperature. It was interesting to learn that Celsius had the scale in reverse of that used today. So his water froze at 100°C, and boiled at zero. He felt that water had attained it’s highest form once solid! It was fair to say therefore, that temperatures were soaring in the snow that weekend. If you enjoyed reading the above article then you will probably also enjoy Altai Republic in Russia by Graeme Down, and Mallorca, also in Europe, and our latest articles covering the Orinoco Delta, La Mata, Marbella and Beijing.